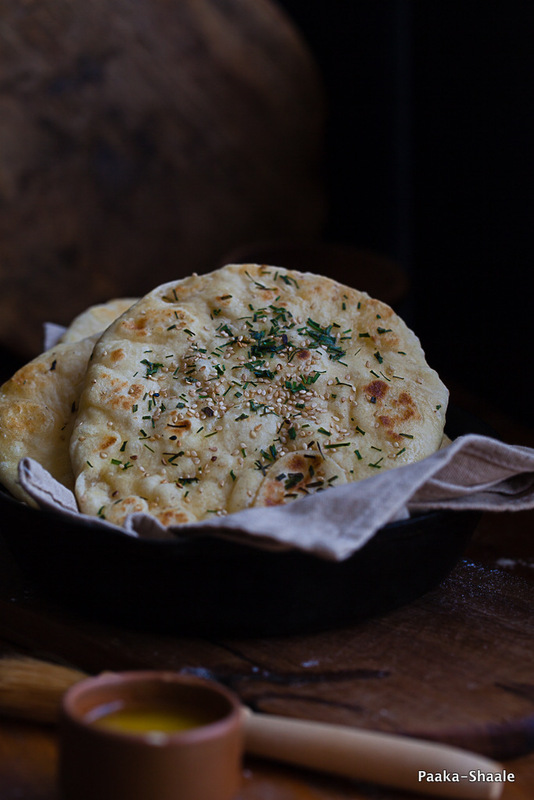 Naan is perhaps one of the most preferred Indian breads. I am yet to come across a person who does not like naan. This soft, and slightly chewy bread, makes a great accompaniment to any type of curry. With Naan on the side, one is sure to polish of every last bit of gravy. It is that good. 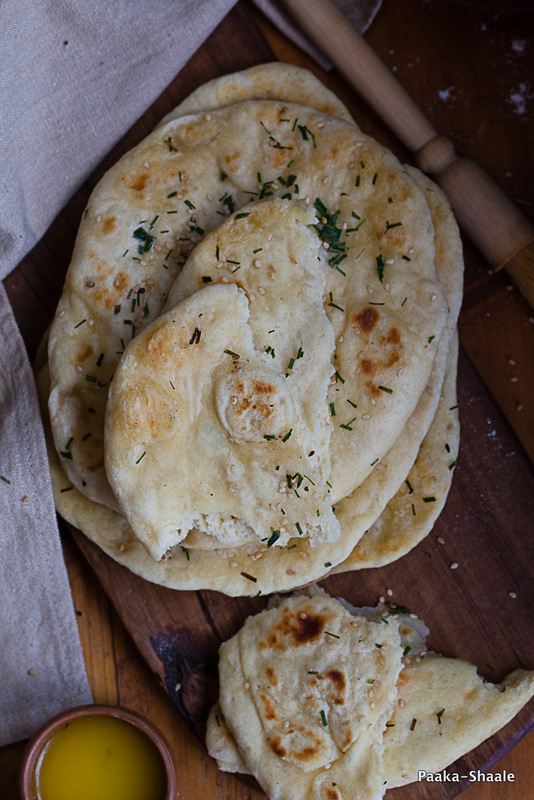 I never grew up eating naan at home. We would mostly devour this bread at the local restaurant. Until my teenage years, I believed that naan was something that could never be made without a tandoor. Hence, it could never be made at home. But all that changed when a classmate of mine got these yummy Naans from her house. It was tender, soft and it just melted in my mouth. It must have just come off the skillet because the packet in which she had carried the box had melted. It was so good that my friends and I had fought shamelessly for that extra piece of naan. I remember asking her if she owned a Tandoor. You can imagine my surprise and shock when she told me that her mother had made those lip smacking naans on the regular tawa or skillet. At that moment, I realized that restaurant food can be made at home. And it can taste great if not better. There are different ways to make naan. It can be made by using yeast, which is the traditional method. It can also be made by using baking soda and/or baking powder. Which, I have heard that it is a quicker version but I am yet to try that method. 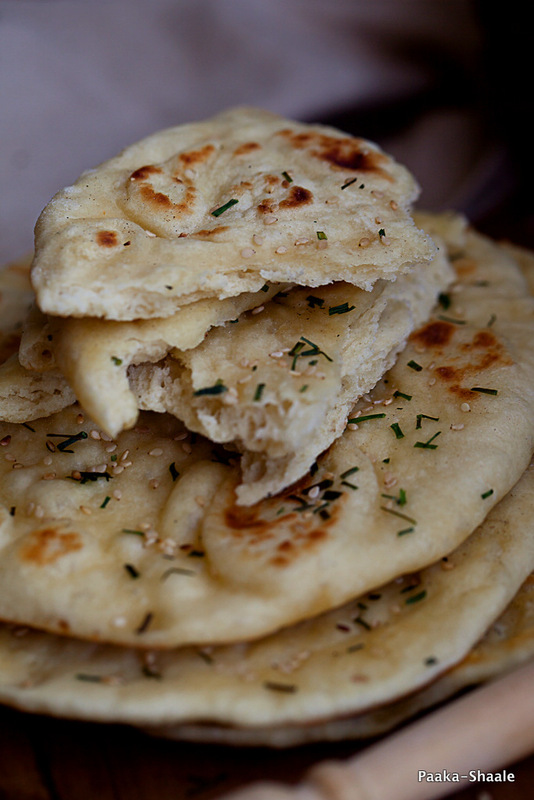 Like sandwiches, Naan can have different flavors and fillings. It can be flavored stuffed with potatoes, cheese, meat, or a simple, spiced, onion mixture. I have also read a few recipes, which had sweet fillings in them. I have used sesame seeds and chives on top to flavor this. But you can use cilantro, mint, chopped garlic, chopped green chilies, etc. With Naan, the sky is the limit. So you can really let your imagination run wild. The naan can be enjoyed in many ways. It can be used in wraps, as a pizza base or you can enjoy it with a mughlai curry on the side. Do not be intimidated with the long preparation time. This delicious bread is worth every bit of the effort. 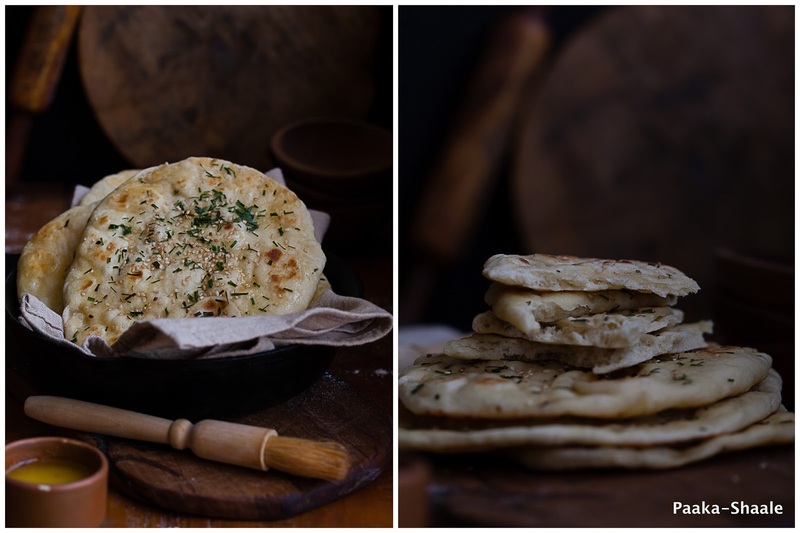 Try making naan in the comfort of your home and find you own ways to enjoy. Mix the warmed milk with yeast and sugar. Stir to dissolve and set aside for 30min or until it starts to bubble. In a large bowl, combine the flour and salt and mix well. 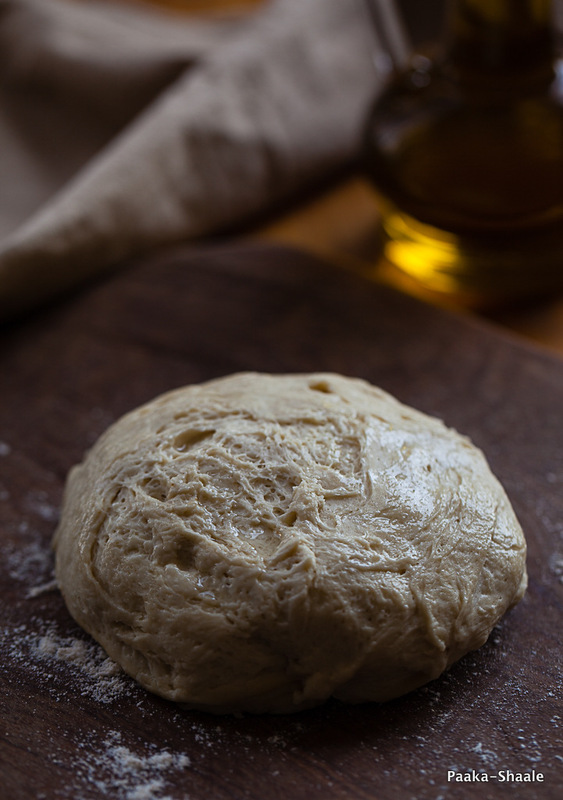 Make a well in the centre and add the melted butter, yogurt, and the yeast mixture and mix to form a rough a dough. Bring together with your hands. The dough should be soft and sticky. So add more water if needed. Knead the dough the on a flour dusted surface for 5-10min until smooth and place the dough in a lightly floured bowl, cover with a wet tea towel and set aside for an hour or till the dough doubles in size. Once risen, transfer the dough back to the work surface and punch the dough and knead for a minute more. Divide the dough in 12 equal portions and roll each portion into 4”in diameter. Sprinkle some sesame seeds and half a tspn of chives and roll the dough into an oblong of 6-7” using a little flour. Heat a girdle and place the rolled naan with the sesame seeds side facing downwards. Cook it on one side till it puffs slightly. Turn and cook it on the other side till it puffs some more. Then, put the naan on the open flame till it turns golden on both sides. Repeat the process with the rest of the dough. 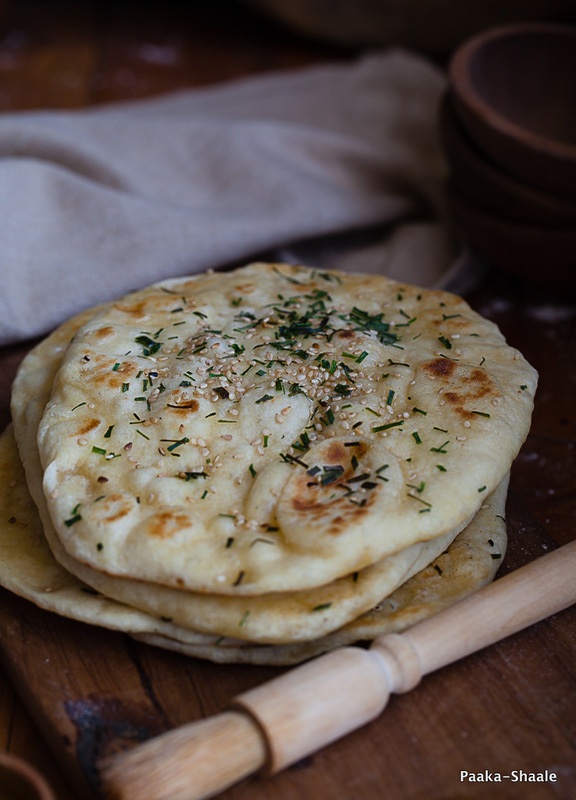 Brush each naan with ghee or melted butter and serve hot immediately. wow! I don't mind NAAN for supper.. so perfect! 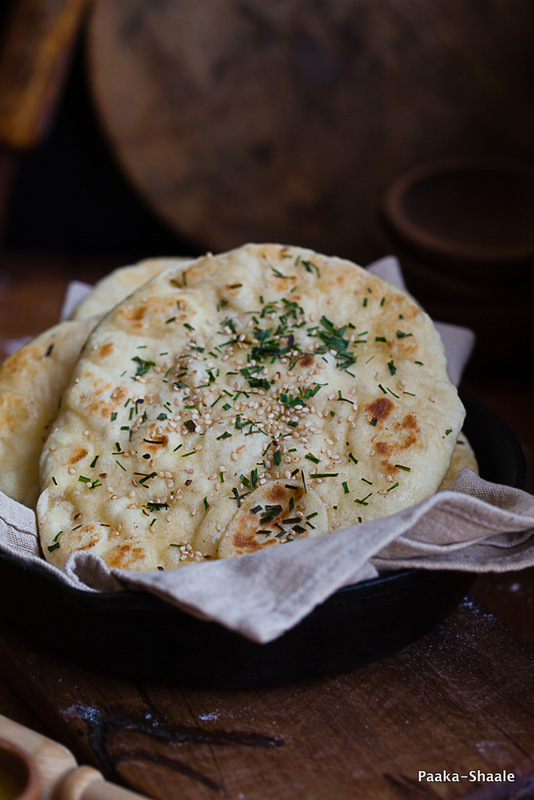 Very nice recipe of naan, sesame seed will give at a different taste.